New Year's Eve is a holiday that can go one of two ways in terms of content: it's either memorable in the good way (see: the best night of your life) or memorable in the bad way (see: a terrible end to one year and start to another). So, in effort to make this one memorable in a good way, I've decided to live my life by a Friends New Year's Eve episode, and, honestly, you should, too. Because everything that was and is good in this world is a direct result of that sitcom. Also, the Friends just really know how to do a holiday the right way. If you're anything like me and have succumbed to awful, exponentially expensive parties and Twilight Zone marathons in New Year's past, I assure you, despite your bleak outlook, that there is still hope for a fun way to ring in the new year. I mean, if you've ever watched Friends, you know that you should never lack enthusiasm for this day. After all, the New Year's episodes are some of the most iconic of the entire series. 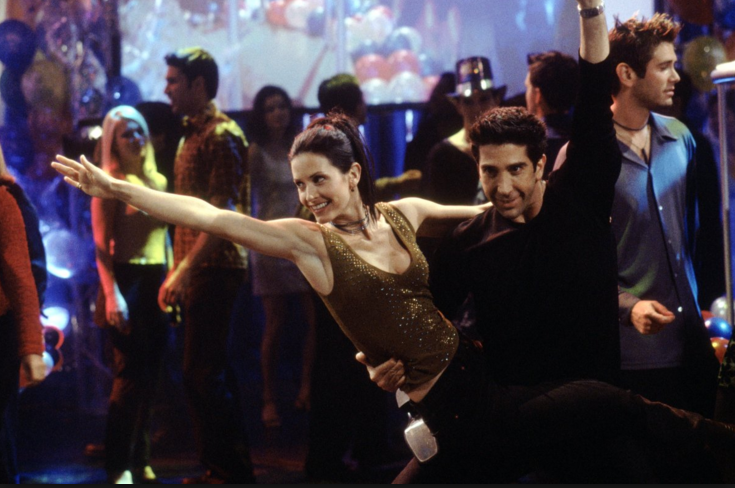 Here is how to live your best New Year's Eve, according to the colorful characters of Friends, who (despite what you may think) are not your actual friends. To have fun. But mostly to impress all the fellow guests/clubbers. Attention will come to you. Chandler did warn Ross about the tightness, so now I'm warning you. Passing on the disapproving love, ya know? Or, this will happen. Ross Geller's life is a cautionary tale. Start small. Also, you're just opening up a can of worms with all that self-righteousness.